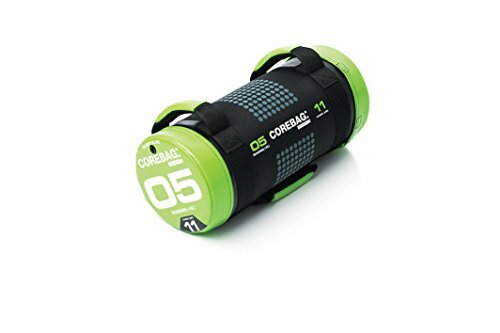 The Corebag is ideal for introducing compounds lifts and strength training - it is also a perfect alternative to medicine balls, dumbbells or barbells. Develop technique with a functional tool where you can progress through weights. Using your upper and lower body at a same time, this Corebag helps to enhance stability, endurance and power and also is an ideal gear for muscles building, fat burns and utmost agility. It's ideal for lunges, squats and presses in a functional circuit. With an updated design and new colors, this escape fitness staple has had a makeover. It's better than ever, with a soft outer covering and more handle options for increased functional exercise opportunities. Commercial-Grade quality. Escape fitness equipment has proved itself in fitness and health clubs around the world. From personal trainer sessions to large studio workouts, its high-quality products deliver on durability, functionality and style. Grab your phone for workouts with the escape your limits fitness app. Now there's support for anyone working out with escape's functional training equipment in the gym, outdoors, at work or at home. Available as a free download for apple IOS and android, the escape your limits fitness app provides you with workouts and exercises to help you get the most out of your training tools. Get inspired. If you're looking for the inspiration to meet your goals in and out of the gym, download and subscribe to the escape your limits podcast. Join Matthew Januszek, co-founder of escape fitness, as he delves into the mindset of leadership and success. Simply search iTunes or your chosen podcast app for "escape your limits". If you have any questions about this product by Escape Fitness USA, contact us by completing and submitting the form below. If you are looking for a specif part number, please include it with your message.